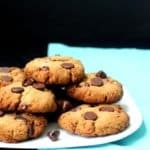 These Grain-Free Chocolate Chip Cookies come together in the food processor, take no more than 15 minutes to make, and they're naturally sweetened, which makes them a pretty sweet deal. A gluten-free, vegan and soy-free recipe. Place the drained dates in the bowl of a food processor and process until pureed. If you don't have a food processor, use a blender to puree the dates and then proceed with mixing the remaining ingredients in a bowl. Add the two flours, vanilla, oil and baking soda to the food processor and mix until the dough comes together. Remove the cookie dough to a bowl and mix in the chocolate chips. Divide the dough into 12 balls and flatten them between your fingers before placing on a parchment- or foil-lined baking sheet. Bake for 10-12 minutes. If you want softer, chewier cookies, get them out of the oven after 8-10 minutes. For more crunchy, darker cookies, cook a couple of minutes longer.